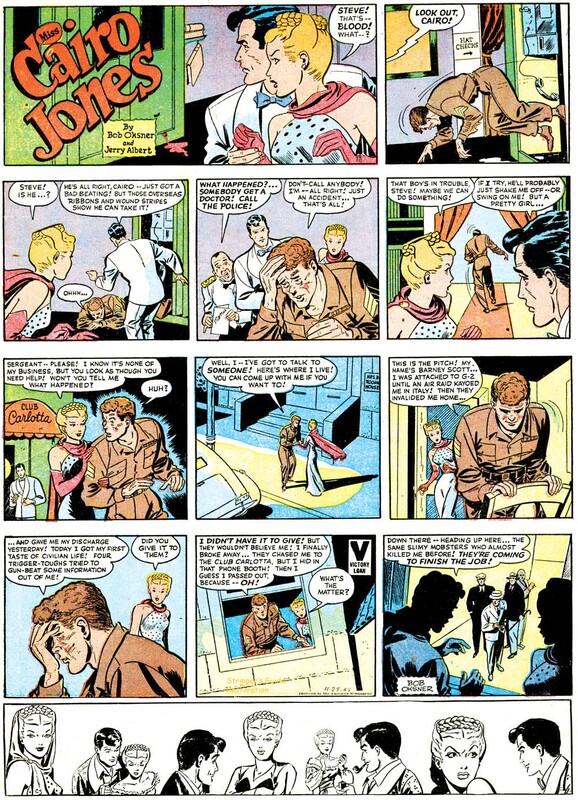 Ron Goulart tells pretty much everything we need to know about Miss Cairo Jones in his excellent book, The Encyclopedia of American Comics. He says that two fellows from the comic book industry, artist Bob Oksner and writer Jerry Albert, took an idea for a slam-bang action hero named Cairo Jones to Bell Syndicate. 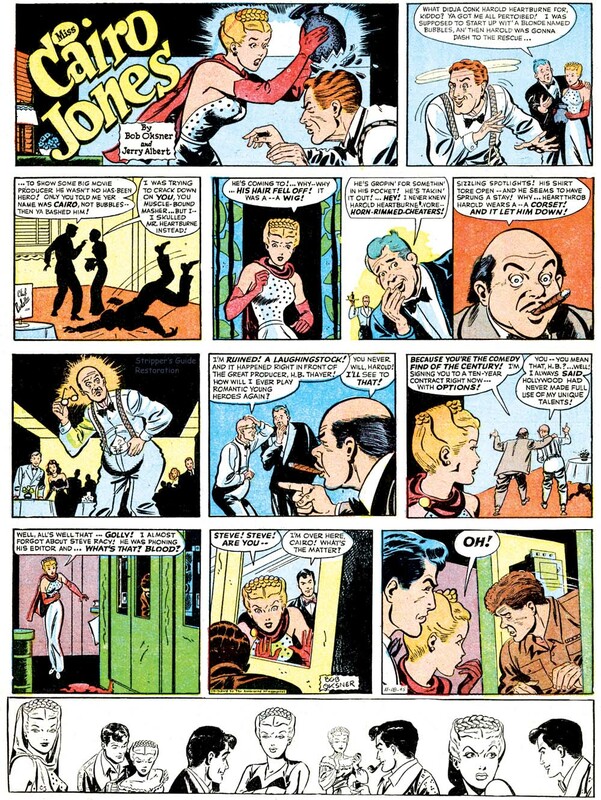 Syndicate president John Wheeler did the ol' Orphan Otto switcheroo, asking the creators to revamp the strip with a female lead. That was easily done -- Cairo became a Miss, the original hunky hero was renamed Steve Racy and his role was reduced to second banana, and the strip was off and running on July 29 1945.It was distributed by North American Newspaper Alliance's Associated Newspapers imprint. Running is an apt description of Miss Cairo Jones. The strip, which began as a Sunday-only feature, had a breakneck pace in which we never really learned all that much about Cairo or Steve -- their overdrive adventures zipped by too fast for boring background stories, recaps, or, well, really any exposition at all. But it was all good fun, especially when Miss Cairo was found to have the same odd habit as other adventure heroines -- losing some or all of her clothes with startling frequency. Oksner's ability to draw gorgeous females was certainly the star of the show in this strip. Perhaps sensing that a well-crafted plot was not of paramount importance to the strip, or due to the disappointing sales figures, Jerry Albert's credit dropped from the strip sometime before mid-1946. With Oksner now taking on writing duties, the new adventures dialed down the pot-boiler level and amped up the humor. A daily strip was also added sometime in July 1946, perhaps under the thinking that the new direction would make the strip more palatable to newspaper editors. Nothing could be further from the truth, as the daily sold like ice cubes to Frigidaire dealers. The syndicate gave up on the daily pretty quick. The latest it has been found so far ends mid-story on January 4 1947 (Port Chester Item, via Jeffrey Lindenblatt). The Sunday, which Goulart very liberally claims to have run in a hundred papers at the height of its sales success, was cancelled on April 27 1947. As far as I know, Jerry Albert never got involved in another newspaper strip. Oksner, on the other hand, would come back to the trough pretty regularly. His next foray was supplying art for the I Love Lucy strip, for which he was a perfect choice to delineate Mrs. Arnaz's classic features.